The raw materials of ORGAMIN DA are 1)Extract of fermentation. Fish, molasses and bean are separately fermented. 2) Magnesium sulphate, 3) Manganese sulphate, 4) Boric acid, 5) Zinc sulphate, and 6) Molybdenum. Those miner elements are mixed to Extracts of fermentation. 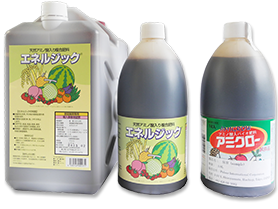 The extracts of fermentation includes various organic materials such as amino-acids, vitamins, sugars, and nuclaic acids. They are compornents of plant enzymes or other plant nutrition factors. Small contents of nitrogenand potassium are originated from raw materials of fermentation. 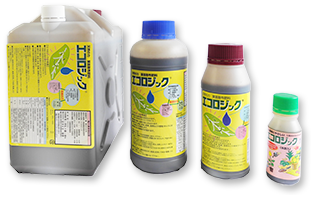 The basicfermentation technique is traditional Japanese know-how. 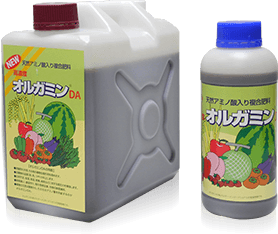 The first product of the ORGAMIN series foliar fertilizers. Basic concept is same to ORGAMIN DA but, it could be used under higher dose per area. Wood vinegar is added to ORGAMIN DA. Purpose is to reduce fermentation smell of ORGAMIN DA for easier use of house gardens.